If you happen to be traveling around Europe and stop in at a small circus studio (in Berlin perhaps?) or a tented show (somewhere outside Barcelona?) and you tell them you are from Brattleboro, chances are they'll say, "Do you mean Brattleboro, the home of NECCA?" This happens more often than you might think, unless you are in the know about the amazing reputation that NECCA (New England Center for Circus Arts) has as a circus arts teaching institution. 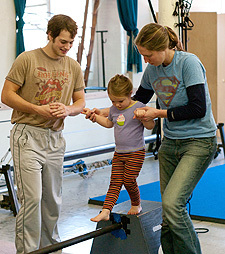 In less than 8 years, NECCA has made Brattleboro a destination for those seeking the highest level of circus arts instruction. And in that time, Elsie Smith, co-founder and Artistic Director, has had her camera at her side during classes, rehearsals and performances. She started photographing circus artists at work when she was performing with Cirque du Soleil as a duo trapezist with her twin sister, Serenity Forchion. Now, with over 5,000 students per year crossing their threshold, she has plenty of opportunities to catch the circus arts on camera. "Through Our Eyes: A Photographic Exploration of the Circus Arts," showing at the Latchis Main Theatre in February and March, is the result of years of watching NECCA students discover and excel at their art form. "It's the combination of exotic and real, and art made physical, that draws me," says the photographer. Some of the images are of the youngest students making their first attempts at unusual skills like balancing on a wire or trying their first trapeze trick. Many of the photographs show the care and attention that their teachers give them as they make these first steps toward achieving an "impossible" activity. "I've always been drawn to the intimacy of these moments, the quality of an instructor creating a safe place for magic to happen." NECCA loves collaborations, and one part of the exhibit resulted from a connection with the In-Sight Photography Project. Sophia Martel, a student at both In-Sight and the circus school, photographed NECCA classes for her In-Sight project, and was herself pictured as a budding aerialist, trying a difficult trick on the trapeze with hands-on guidance from her NECCA coach. Other photographs in the exhibit show the result of years of training, when the physical "tricks" become full-length acts filled with artistic expressions. As a performance art, Elsie believes that "the circus acts are easy to transform into exciting photographs because the viewer has already been invited to participate." Because NECCA has been so successful in training its students, the images include award-winning acrobats whose careers started right here in Brattleboro. The exhibit is part of an annual Circus Spectacular fundraising event, this year on March 5 & 6. Guest artists from circuses around the world star in this performance, and NECCA's most successful graduates come home to their roots. This is a unique opportunity to see some of today's most renowned high flying aerialists, acrobats, and jugglers on the Latchis Theatre stage. For the first time in Vermont, the star of Cirque du Soleil's Corteo, Jeff Raz, will emcee this year's cabaret of performers. Also bringing an international flair to the show are award-winning Chinese-pole artists American Sam Payne and Swiss Sandra Feusi. 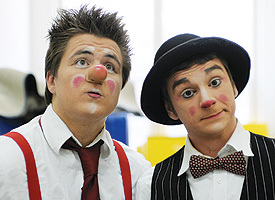 Payne and Feusi toured for 6 years with Cirque du Soleil's Saltimbanco before starring in circuses in Europe and the United States. In addition to emceeing the event, Raz will be teaching workshops on Monday, March 7, that are open to the public. All proceeds from this annual event support circus outreach programming. NECCA offers free and discounted programs with many collaborators for at-risk youth including Brattleboro housing developments, The Boys & Girls Club, the Brattleboro Retreat and Kurn Hattin Homes. Other outreach programs include working with children on the Autism spectrum, adults with physical disabilities, and a special program for cancer survivors. Approximately 1 in every 6 NECCA students receives some form of tuition assistance for the school's many programs, ranging from physical literacy for youth to professional training for adults. 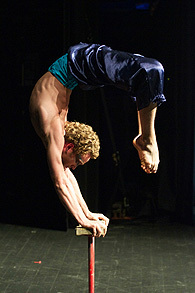 For tickets and more information about the school, please visit www.necenterforcircusarts.org or call (802) 254-9780.